Vol.2(4) 2011: Cover photo is copyrighted by Earth Wind & Fire Co.,Ltd. This winner photo from the Fourth Thailand International Balloon Festival 2010 was taken by Mr.Pakorn Chunhasawasdikul (Photo is used with permission). Young shoot tips were used as explants and cultured on MS medium supplemented with varying concentrations of (0.1, 0.5, 1.0 mg/l) BA and (0.1, 0.5, 1.0 mg/l) NAA. Calli and new shoots were grown on MS medium supplemented with combination of 0.5 mg/l BA and 0.5 mg/l NAA. New shoots averaging 0.5–0.8 cm were irradiated with varying doses of gamma rays (5, 10, 15, 20 grays). Gamma irradiation had various effects on growth of Torenia fournieri. Higher dosage of gamma irradiation reduced plant height, number of roots, number of leaves, leaf length, leaf width, petiole length and number of guard cells at abaxial and adaxial epidermis surface. Plant morphology and flower development was also modified. The use of a genetic algorithm is presented to solve a facility layout problem in the situation where there is non-restricted space but the ratio of plant length and width is pre-determined. A two-leveled chromosome is constructed. Six rules are established to translate the chromosome to facility design. An approach of solving a facility layout problem is proposed. A numerical example is employed to illustrate the approach. In some practical applications of the mobile robot, it is expected to ensure the fullest coverage of a certain area with or without obstacle avoidance. This paper shows that both chaotic and non chaotic signals can be advantageous for providing good coverage performance. Our study includes, in addition to parameters adjusting and mapping the appropriate chaotic variables to robot's kinematic variables, a comparison of the coverage performance generated by three different behaviors of Chua’s circuit. These behaviors include an instable focus and two chaotic signals having single scroll and double scroll shaped phase portraits respectively. Contrary to a commonly held belief, a non-chaotic behavior can lead to generate complex trajectories of a mobile robot and to provide better coverage performance. Such behavior is an instable focus which is a repeller, obtained by using a particular parameter set of Chua’s circuit. A 500 birds/hour chicken slaughtering system with improved designs was used to investigate optimized operational parameters of scalding and defeathering process under chicken characteristics in Vietnam. The experiment is designed based on Orthogonal Second-order Design. Results of analysis of variance presented that scalding temperature and distance between two defeathering bands have had a most significant effect on product quality. The optimal solutions showed that the optimized operation parameters are 1.8 (m3/20birds) in scalding water flow, 67 (0C) in scalding temperature and 80 (seconds) in scalding time for scalding machine; and 415 (mm) in gap between two defeathering bands, 340 (rpm) in defeathering disc velocity and 120 (seconds) in defeathering time for defeathering machine. The implementation results of the lines designed based on these optimized operational parameters have confirmed the appropriateness for the optimization values suggested. Micro Plasma Arc Welding plays a vital role in attaining good weld quality in various engineering applications like bellows, diaphragms etc. The main objective of the present work is to use current pulsing technique while welding SS304L sheets. 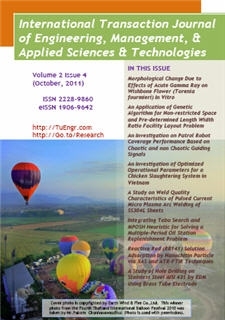 The paper focuses on studying the influence of various Micro Plasma Arc Welding process parameters like peak current, back current, pulse and pulse width on the weld quality characteristics like weld pool geometry, microstructure, grain size, hardness and tensile properties. The results reveals that the usage of pulsing current, grain refinement has taken place in weld fusion zone, because of which improvement in weld quality characteristics have been observed. Multi-period oil station replenishment problem is one type of vehicle routing problem that has constraints such as number of truck, capacity of truck’s compartments and capacity of tank space in each station. Generally, the objective of vehicle routing problem is to minimize the transportation cost. Solving the large problem to find the best solution is complex and difficult. Because, in the large problem, many conditions and parameters are calculated, then the computer calculation is time consuming. In this study, the Multi-Period Oil Station Replenishment Heuristic (MPOSH), and integration between MPOSH and Tabu Search called Tabu MPOSH are constructed for performance tests. The problems are investigated with varied sizes, such as: number of stations are 5, 10, 20, 50, and 75 stations, and the demand frequencies in each station are 5, 10, and 20 days, the trucks used in transportation are 2 to 38 trucks, and the demands are two values (maximum and minimum). The results show the hybrid between MPOSH and Tabu Search or Tabu MPOSH with number of run 350 cycles (iterations) yields the better solution than others. Observantly, setting the higher iterations will improve the solution results. The solved information shows number of days for delivery, number of trucks, and stations of trips in each day. Adsorption of reactive dye solution on nanochitin and chitin particle under acidic, neutral and basic condition was studied. The percentage adsorption of reactive dye solution on nanochitin and chitin under basic condition was 98% and 59%, respectively. In this study, we used ATR-FTIR spectroscopy to study the adsorption mechanism between nanochitin and reactive dye. The results indicated that the amine group of nanochitin was a functional group for the adsorption of Reactive Red (RR141) under acidic condition while the hydroxyl group of nanochitin was the main site for adsorption of Reactive Red (RR141) under basic condition. Azo group (N=N) of reactive dye might be electron donor, while amide group (-CONH2) of nanochitin was electron acceptor under neutral condition. XAS spectra obtained the changes of S atom in RR141 adsorbed onto nanochitin under acidic, whereas adsorption under neutral and basic condition caused no change in the form of S- atom in the dye. When a depth hole is drilled by EDM, taper is occurred which is not desired in the process. This research was focused on influence of EDM parameters on material removal rate (MRR), electrode wear rate (EWR) and tapered hole of martensitic stainless steel AISI 431. The considered factors consist of electrical current, on-time, duty factor, water pressure and servo rate. The experimental results reveal that MRR increases when increasing of servo rate. The taper of hole increases with increasing of electrical current and servo rate. However, it is reverse proportion to water pressure and duty factor.